Facebook has revised the company’s Facebook Pages Terms from December 17, 2012. There were two major revisions but we are just going to talk about the one to do with only being allowed to have 20% as your text overlay on page cover photos. 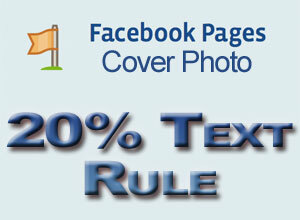 The 20% rule for Timeline cover photo has left many page administrators with questions, so here we will answer how you can determine what 20% of the cover image is and make your cover comply with this new rule. This is what the Facebook Page Guidlines states for cover photos. The first of these rules which states you can not have, “Images with more than 20% text”, as your cover photo is the one we will be discussing today. Determining if your cover photo is ok.
To determine if your text is within the 20% limit of a Facebook cover image, you need to have a tool that measures screen items in pixels, I have used a free tool called “Meazure” for this example (http://www.cthing.com/Downloads.asp). 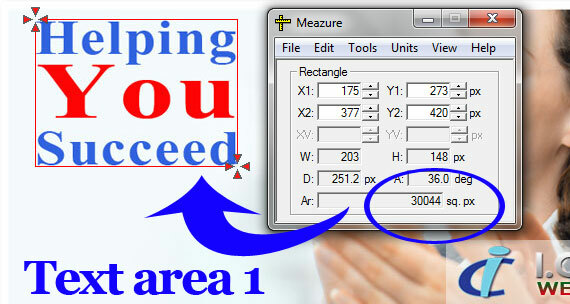 You can use this tool to calculate how large your text blocks are in the following way. Then if you multiply the result by .20, you will have the amount of square pixels that you can use and still stay within the 20% limit. 268,065 total square pixels x .20 = 53,613 square pixels usable for text. You then need to work out what the square pixels of your existing text are in your cover photo, and make sure they are under the 53,613 pixel limit. If you have multiple areas of text, then just work out each area and add them together. Practical example, the I.C. Enterprises cover photo. As you can see, the cover photo on I.C. Enterprises has 2 areas of text on it. The first is the slogan “Helping You Succeed” and the second is the name “I.C. 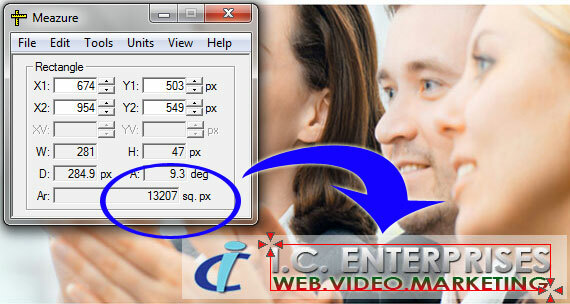 Enterprises” and tagline “Web.Video.Marketing”. There are 2 seperate text areas on the cover photo for I.C. Enterprises. 30,044 pixels + 13,207 pixels = 43,251 pixels = 16.13% of cover photo area as text. So this photo is well within the guideline. How are Facebook going to police this? There has been a lot of questioning regarding exactly how Facebook is going to measure the 20% rule on cover pages, and as a graphic designer, I can see a few problems with the rule straight off. When you create text, there is spacing arould the letters and within certain characters. Nobody really knows if Facebook is going to allow for this or if the text will be measured in “blocks”. For safety sake, and to make it easier to work out, my recommendation is to measure your text in blocks so either way they are under the 20% rule. This will ensure that no matter which way Facebook measure it, your cover will be safe. Why is Facebook implementing the new 20% text overlay rule? Facebook people react negatively to content that they perceive as inauthentic or impersonal. Since text is rare in photos from friends, text in brand photos triggers negative emotions in people. Instead of introducing text in your images, choose photos that send a message or tell a story on their own without words. Keep it simple. People should be able to tell what your image represents without having to scan your photo for minor details or read fine print. The simpler the image, the clearer your brand message will be. Focus on quality. It’s a simple thing, but make sure that your photo is of high enough resolution to represent your brand in a positive light. Basic screenshots are often low quality, can appear grainy, and may cheapen the effect of your post. Comment below and let us know what you think of the new Facebook rule, and if your cover photo fit into the new guideline….